CubeSat technologies have made budget space missions accessible to a wide range of organisations for furthering education, science, outreach, technical and business objectives. Many emerging space nations use this format and over 40 nations have placed CubeSats into orbit. 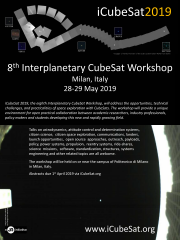 The utility and ambition of CubeSats is rapidly increasing with a wide range of Lunar and Interplanetary CubeSat missions being proposed and developed for flight. However there are still several barriers for resource constrained missions; including affordable transportation opportunities to these more challenging destinations and communications with Earth. The Lunar Communications Pathfinder is the first planned mission, comprising a ‘Mothership’ which delivers customer Small Satellite and CubeSat missions into Lunar Orbit. The Mothership then provides data relay services with Earth via a dedicated, commercial ground segment. The mission is financed by ticket pre-sales for the services with a range of incentives for early adopters of the system. There is significant international interest and growing commitment from industry, space agencies and commercial companies keen to be customers and pioneering partners for this mission, and its successors. We will present the current status and next steps towards project implementation, launch and service provision.